Location: County Road 515, Philadelphia, Miss. The Freedom Summer of 1964, dedicated to voter education and registration in Mississippi, was met with fierce opposition. In the wee hours of June 21, 1964, civil rights workers James Chaney of Meridian, along with Michael Schwerner and Andrew Goodman, both of New York, were arrested by local law enforcement in Philadelphia, Mississippi, who were members of the Ku Klux Klan. After they were released, KKK members abducted and killed them, burying their bodies in a dam and covering them with a bulldozer. The disappearance of the young men forced President Johnson to have J. Edgar Hoover organize a search. Their bodies were discovered 44 days later, and their deaths were fuel for the Civil Rights Movement to seek the passage of the Civil Rights Act of 1964 and Voting Rights Act of 1965. The murders and subsequent trial were dramatized in the 1988 film Mississippi Burning, starring Gene Hackman and Willem Dafoe. 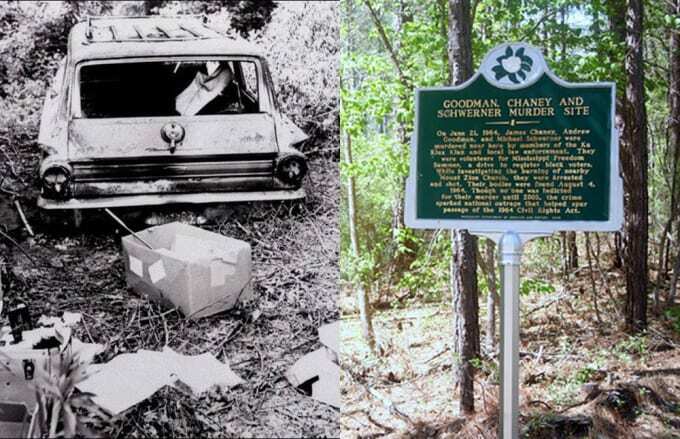 Known as "Rock Cut Road" back in 1964, County Road 515 in Philadelphia is where Chaney, Schwerner and Goodman were pulled from their vehicle, killed, and buried. Today, the road is calm, betraying no signs of what came before.